It appears that Audi has a surprise in store for all the SUV enthusiasts as they've recently revealed that they intend to unveil their first RS badged SUV during the upcoming Beijing Auto Show. 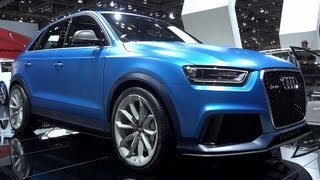 Dubbed Audi RS Q3 Concept 2012, the SUV boasts with incredible performances and an interesting design to say the least. First thing's first, let's take a look under the hood. 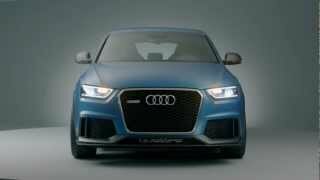 The Audi RS Q3 Concept 2012 sports a 2.5 liter Direct Injection five-cylinder engine that is to be found on both the Audi TT-RS and the Audi RS3. 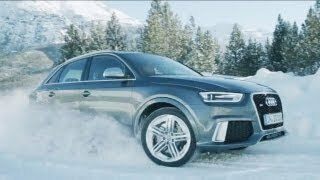 The engine is able to deliver 360 horsepower, it takes 5.2 seconds to accelerate from 0 to 62 miles per hour, and although the speedometer indicates a top speed of 211 miles per hour, the Audi RS Q3 is expected to reach a top speed of 164 mph. The 2.5 liter TFSI engine is mated with a seven-speed S Tronic gearbox which sends the engine's 360 horsepower to all four wheels, and the steering wheel has been fitted with flappy paddles for those eager to involve themselves in a more manual control of the gearbox's shifts. 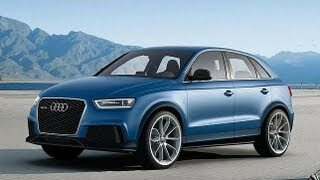 On the exterior the Audi RS Q3 offers a true RS look, sporting carbon fiber lip spoilers, a large front grille featuring honeycomb patterns, a matte blue paint job and a set of enormous 20 inch wheels. We should also point out that ride has also been lowered by an inch. The interior of the Audi RS Q3 Concept 2012 offers a handful of changes, the most notable one being dark blue Alcantara inserts in the Nappa leather upholstery. The exact launch date of the Audi RS Q3 Concept is yet unknown, but we expect it to be a fierce rival to Bentley's new EXP 9 F SUV, and Porsche's Cayenne GTS. Come to think of it, it looks as if the recession has been dealt with, and the dinosaurs that were the gas-guzzling SUV's are starting to come back to life. For a moment I thought the sporty SUV is pretty much a dying breed, but as it turns out, most car manufacturers tend not to agree. 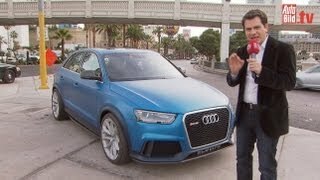 Nevertheless, the Audi RS Q3 Concept 2012 is one interesting SUV and we're eager to learn more about what it can offer as well as its whereabouts once it hits the Beijing Auto Show next week.